Background: Cisplatin is used as chemotherapeutic drug in the treatment of some solid tumors. It causes different side effects such as nephrotoxicity because of increasing oxidative stress and reactive oxygen species production. This study was designed to investigate the effect of Rheum turkestanicum on cisplatin-induced nephrotoxicity in rat. Materials and Methods: Animals were randomly divided into four groups (six each). Group I received normal saline (1mL/day, intraperitoneally [i.p.]). Group II received a single dose of cisplatin (8mg/kg, i.p.). Groups III and IV received extract at doses of 100mg/kg and 200mg/kg, i.p., respectively, for 3 consecutive days, 1h before a single dose of cisplatin only at the first day. Blood samples were taken for measuring the level of urea and creatinine. Furthermore, 24-h urinary factors such as glucose and protein were measured. Histopathological observation was carried out on kidney sections. Statistical analysis was performed using one-way analysis of variance followed by Tukey–Kramer post hoc test for multiple comparisons. 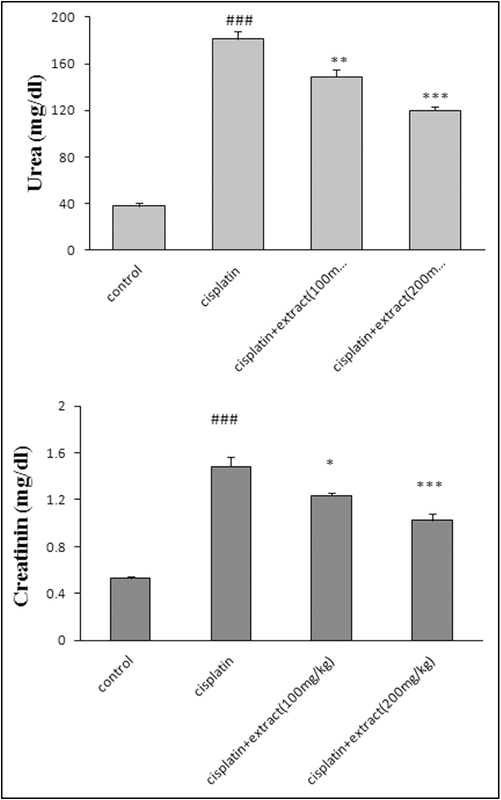 Results: Cisplatin increased the lipid peroxidation, serum creatinine, serum urea, urinary glucose, and urinary protein, whereas decreased the content of thiol in kidney. The extract reduced serum creatinine, serum urea, urinary glucose, urinary protein, lipid peroxidation, and increased thiol following cisplatin administration. Histological studies revealed lower lesions in kidney in the extract-treated groups compared to cisplatin-treated one. Conclusion: This research showed the extract has protective effect against cisplatin-induced nephrotoxicity. This observation may be related to antioxidant properties of the extract. Cisplatin as a chemotherapeutic drug is used in the treatment of different types of malignancies including head, neck, ovarian, and testicular cancers. However, clinical use of cisplatin is restricted because of nephrotoxicity. A total of 28%–36% of patients that receive initial dose of drug show acute renal injury. Cisplatin causes apoptosis, necrosis, and inflammation of renal cells., It induces nephrotoxicity by reactive oxygen species (ROS) and nitrogen species production. They lead to oxidative stress damage and antioxidant depletion; therefore, combination of cisplatin with antioxidant compounds may decrease toxic effects. Many studies have shown that the combination of cisplatin with natural and herbal products as antioxidant reduced cisplatin-induced nephrotoxicity. Natural products contain different ingredients; therefore, they have important position in traditional medicine. One of the important compounds of herbal medicine is antioxidants that can have protective effects against toxic agents. There are many studies that have shown that the herbal medicine ameliorated nephrotoxicity following cisplatin administration. Aged garlic extract, onion oil,Artemisia asiatica extract,Nigella sativa, crocin, and pomegranate seed oil revealed protective effects against cisplatin-induced nephrotoxicity. Rheum turkestanicum is from Rheum species that grows in Asia and northeast of Iran. The Rheum species contain different compounds such as anthraquinones, dianthrones, glycosides, and tannins. The anthraquinone derivatives include emodin, rhein, chrysophanol, physcion, alizarin, citreorosein, and aloe-emodin. In traditional medicine, R. turkestanicum is used as antidiabetic and antihypertensive. Recent studies have shown anticancer and antidiabetic effects. In addition, Hosseini and Rajabian, showed R. turkestanicum reduces doxorubicin toxicity in H9c2 cell line via decreasing of ROS production. Pharmacological effects of R. turkestanicum show that this plant has high antioxidant potency. Increase in ROS plays an important role in cisplatin-induced nephrotoxicity; therefore, it is probable that R. turkestanicum can reduce cisplatin toxicity. In this research, 24 Wistar rats with weight between 220 and 250g were purchased from Animal House, Faculty of Medicine, Mashhad University of Medical Sciences, Mashhad, Iran. The animals were kept in a pathogen-free facility on a 12-h light/dark schedule, with free access to food and water ad libitum. All protocols were confirmed by the University Ethics Committee and were in compliance with the national laws and with the National Institutes of Health guidelines for the use and care of laboratory animals. DTNB (5,5’-dithio-bis-[2-nitrobenzoic acid]), TBA (2-thiobarbituric acid), n-butanol, Na2EDTA (ethylenediaminetetraacetic acid disodium salt), Tris (hydroxymethyl) aminomethane, HCl, KCl, phosphoric acid (1%), ether, TCA (trichloroacetic acid), and methanol were bought from Merck (Darmstadt, Germany). Cisplatin was purchased from Mylan Company (Canonsburg, United States). The root of R. turkestanicum Janisch was obtained from Razavi Khorasan Province, Iran and identified by M. R. Joharchi from Ferdowsi University of Mashhad Herbarium. A voucher specimen (No. 21377) was deposited to this plant. Dried root was ground into fine powder and then 50g of this powder was subjected to extraction with 70% ethanol in a Soxhlet apparatus for 48h. The hydroalcoholic extract was then dried on a water bath and stored in −18ºC freezer. The yield of the extract was 25% (w/w). In this research, the animals were divided into four groups (six each). Group I (control) received 1mL/kg of normal saline intraperitoneally (i.p.). A single dose of cisplatin (8mg/kg, i.p.) was administered to group II. Groups III and IV were treated with R. turkestanicum (100 and 200mg/kg) 1h before cisplatin (8mg/kg) injection. All procedures were carried out between 10:00 and 12:00 AM. The experiment lasted for three consecutive days. The 24-h urine samples were collected for measuring glucose and protein concentration before killing animals. The animals were then killed using ether anesthesia. Blood samples were taken by cardiac puncture for measuring the level of serum urea and creatinine. One kidney was homogenized in cold KCl solution (1.5%, pH: 7.4) to make a 10% homogenate suspension and used for measuring malondialdehyde (MDA) and thiol content. Other kidney was used for histopathological studies; it was dehydrated with ethanol and cleared in xylene and embedded in paraffin, sectioned, and stained by hematoxylin and eosin for histopathological assay. Glucose and protein concentrations were determined by earlier methods., Urea concentration was determined colorimetrically using AutoAnalyzer (Technicon RA-1000, London, England) and urea kit (Man Lab Company, Tehran, Iran). Creatinine concentration was determined by Jaffe’s method. MDA, which is the end product of lipid peroxidation, was measured as a marker of lipid peroxidation of the kidney tissue, and it reacts with TBA as a thiobarbituric acid reactive substance to produce a red-colored complex. This complex has peak absorbance at 532nm. Briefly the procedure is as follows: 3mL phosphoric acid (1%) and 1mL TBA (0.6%) were added to 0.5mL homogenate in a centrifuge tube, and the mixture was heated for 45min in a boiling water bath. After cooling, 4mL of n-butanol was added to the mixture, vortexed for 1min, and centrifuged at 20,000rpm for 20min. The organic layer was transferred to a fresh tube and its absorbance was measured at 532nm. Data were expressed as mean ± standard error of the mean (SEM). Statistical analysis was performed using one-way analysis of variance followed by Tukey–Kramer post hoc test for multiple comparisons. The P values less than 0.05 were considered to be statistically significant. As shown in [Table 1], cisplatin increased urinary protein and glucose. The extract decreased urinary glucose and protein significantly in comparison with the cisplatin-treated group. As shown in [Figure 1], cisplatin increased the level of creatinine (1.48±0.08, ###P < 0.001) and urea (181±7.12, ###P < 0.001) in serum in comparison with the control group, whereas the extract decreased urea and protein in serum, in comparison with the cisplatin-treated groups (100mg/kg: creatinine [1.23±0.02, *P < 0.05], urea [149±6.34, **P < 0.01])); 200mg/kg: creatinine [1±0.057, ***P < 0.001], urea [120±3.124, ***P < 0.001]). 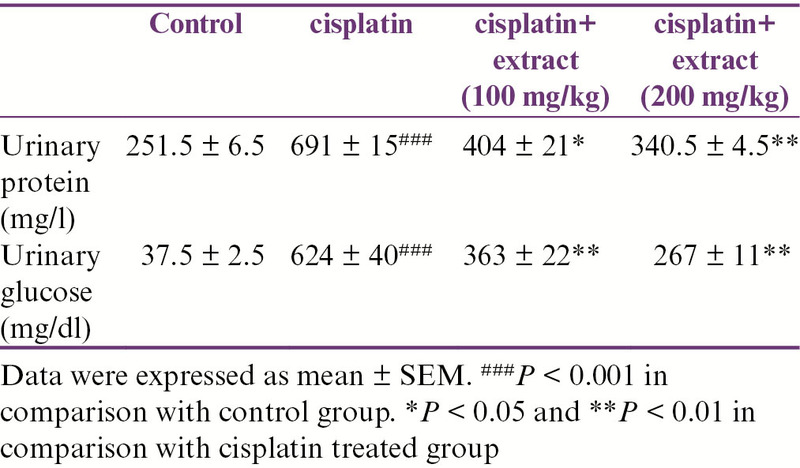 In comparison with the control group, cisplatin increased the level of MDA in kidney (2.1±0.05, ###P < 0.001) and decreased thiol (69.48±5.7, ###P < 0.001). The extract reduced MDA (100mg/kg: 1.8±0.02, *P < 0.05; 200mg/kg: 1.2±0.04, ***P < 0.001) and increased thiol (100mg/kg: 109±3.9, *P < 0.05; 200mg/kg: 128±3.4, **P < 0.01) [Figure 2]. 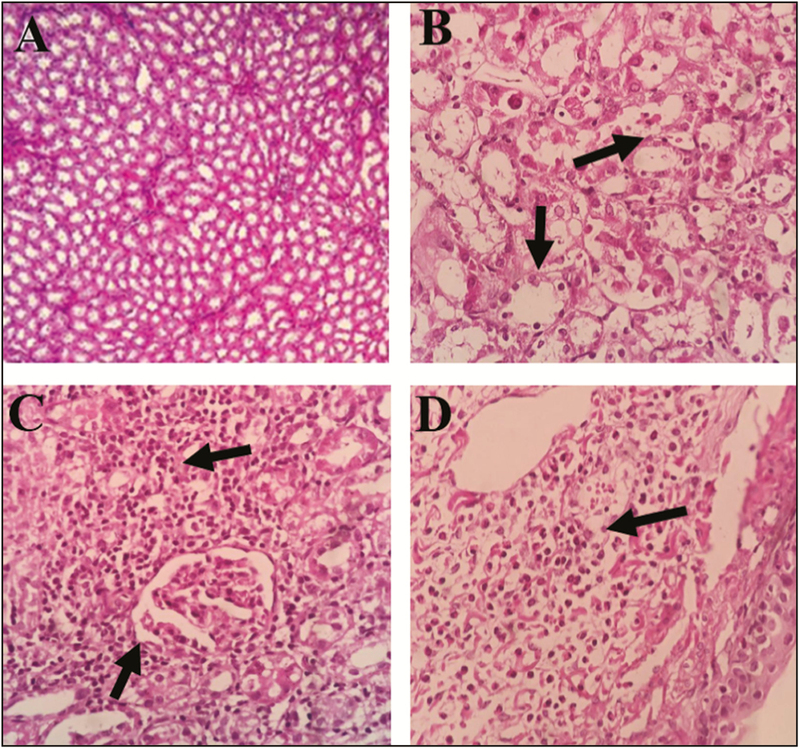 Renal histopathological changes are shown in [Figure 3]. Our observations found some histopathological changes in the cisplatin-treated group (moderate to severe inflammation, interstitial nephritis, and mild necrosis) in comparison with the control group that showed normal structure without any evidence of inflammation, necrosis, and atrophy, but a mild degree of neutrophilia and eosinophilia. In the extract-treated groups, these changes were reversed, but a mild degree of tubular necrosis was seen in group III; however, this observation was eliminated in group IV. Safety, easy to earn, low adverse effects, and popularity are the reasons of herbal medicine to set them as researchers’ viewpoint for patients treatment. In this study, we investigated the protective effect of R. turkestanicum against cisplatin-induced nephrotoxicity. The studies have shown that cisplatin has antitumor effects; however, its adverse effect such as nephrotoxicity has limited its usage. The accuracy mechanism of nephrotoxicity is unclear. It is estimated that free radicals, ROS production, and lipid peroxidation may play a role in cisplatin toxicity. The studies have shown that antioxidant compounds may reduce nephrotoxicity by scavenging of free radicals. Our findings revealed that the administration of cisplatin increased urinary glucose and protein, which correlated with the elevation of serum creatinine and urea. In addition, cisplatin leads to elevation of MDA and decreasing of thiol content in kidney tissue. Our research showed that R. turkestanicum had protective effects against cisplatin toxicity in renal tissue. In comparison with the cisplatin-treated group, the extract decreased the level of urinary glucose and protein and serum creatinine and urea, which led to the improvement of renal function. However, in the extract-treated groups, tubular necrosis was lower than that in the cisplatin-treated group. Also, lipid peroxidation can play a role in cisplatin-induced toxicity. Cisplatin binds to transport system in renal tissue and causes peroxidation of lipids, which leads to free radical production. In parallel with reducing oxidative stress markers, histopathological changes in the extract-treated groups in comparison with the cisplatin-treated group confirmed its potent antioxidant activity and its kidney protective effect against toxic agents. Better glomerular configuration and capillary shape and reduced inflammation were observed in the kidneys of groups III and IV. In a similar study, R. turkestanicum could ameliorate the histopathological changes in diabetic rats with decreasing oxidative stress condition. These findings confirmed extract antioxidant effect. Probably, protective effects of R. turkestanicum against cisplatin-induced nephrotoxicity may be related to active compounds with potent antioxidant activity, with the evidence of reduced tissue oxidative stress markers and histopathological changes, and serum and urinary markers. More studies are needed to understand the accuracy of mechanism(s). The authors are grateful to all scientists in the Department of Pharmacology, Faculty of Medicine, Mashhad University of Medical Sciences, Mashhad, Iran, who helped us to create this work with their honest cooperation. This study was supported by the Pharmacological Research Center of Medicinal Plants, Faculty of Medicine, Mashhad University of Medical Sciences, Mashhad, Iran. Rabik CA, Dolan ME. Molecular mechanisms of resistance and toxicity associated with platinating agents. Cancer Treat Rev 2007;10:9-23. Schrier RW. Cancer therapy and renal injury. J Clin Invest 2002;10:743-5. Arany I, Safirstein RL. Cisplatin nephrotoxicity. Semin NePhlol 2003;10:460-4. Ramesh G, Reeves WB. TNFR2-mediated apoptosis and necrosis in cisplatin-induced acute renal failure. Am J Physiol Renal Physiol 2003;10:F610-8. Kart A, Cigremis Y, Karaman M, Ozen H. Caffeic acid phenethyl ester (CAPE) ameliorates cisplatin-induced hepatotoxicity in rabbit. Exp Toxicol Pathol 2010;10:45-52. Gulec M, Iraz M, Yilmaz HR, Ozyurt H, Temel I. The effects of Ginkgo biloba extract on tissue adenosine deaminase, xanthine oxidase, myeloperoxidase, malondialdehyde, and nitric oxide in cisplatin-induced nephrotoxicity. Toxicol Ind Health 2006;10:125-30. Mollazadeh H, Hosseinzadeh H. The protective effect of Nigella sativa against liver injury: a review. Iran J Basic Med Sci 2014;10:958-66. Nasr AY. Protective effect of aged garlic extract against the oxidative stress induced by cisplatin on blood cells parameters and hepatic antioxidant enzymes in rats. Toxicol Rep 2014;10:682-91. El-Sayed ME, Kamel KM, Fawzy HM, Metwally SA, El-Latif HAA. Protective effects of onion oil and selenium against cisplatin-induced nephrotoxicity and oxidative stress in rats. Egypt J Hospl Med 2015;10:18-25. Park JY, Lee D, Jang H-J, Jang DS, Kwon HC, Kim KH, et al. Protective effect of Artemisia asiatica extract and its active compound eupatilin against cisplatin-induced renal damage. Evid Based Complement Alternat Med 2015;10:1-6. Hosseinian S, Khajavi Rad A, Hadjzadeh MA, Mohamadian Roshan N, Havakhah S, Shafiee S. The protective effect of Nigella sativa against cisplatin-induced nephrotoxicity in rats. Avicenna J Phytomed 2016;10:44-54. Naghizadeh B, Boroushaki MT, Vahdati Mashhadian N, Mansouri MT. Protective effects of crocin against cisplatin-induced acute renal failure and oxidative stress in rats. Iran Biomed J 2008;10:93-100. Boroushaki MT, Rajabian A, Farzadnia M, Hoseini A, Poorlashkari M, Taghavi A, et al. Protective effect of pomegranate seed oil against cisplatin-induced nephrotoxicity in rat. Ren Fail 2015;10:1338-43. Dorsey JF, Kao GD. Aloe(-emodin) for cancer? More than just a comforting salve. Cancer Biol Ther 2007;10:89-90. Shiezadeh F, Mousavi SH, Amiri MS, Iranshahi M, Tayarani-Najaran Z, Karimi G. Cytotoxic and apoptotic potential of Rheum turkestanicum Janisch root extract on human cancer and normal cells. Iran J Pharm Res 2013;10:811-9. Hosseini A, Mollazadeh H, Amiri MS, Sadeghnia HR, Ghorbani A. Effects of a standardized extract of Rheum turkestanicum Janischew root on diabetic changes in the kidney, liver and heart of streptozotocin-induced diabetic rats. Biomed Pharmacother 2017;10:605-11. Hosseini A, Rajabian A. Protective effect of Rheum turkestanikum root against doxorubicin-induced toxicity in H9c2 cells. Rev Brasileira Farmacognos 2016;10:347-51. Lott JA, Turner K. Evaluation of Trinder’s glucose oxidase method for measuring glucose in serum and urine. Clin Chem 1975;10:1754-60. McElderry LA, Tarbit IF, Cassells-Smith AJ. Six methods for urinary protein compared. Clin Chem 1982;10:356-60. Masson P, Ohlsson P, Björkhem I. Combined enzymic-Jaffé method for determination of creatinine in serum. Clin Chem 1981;10:18-21. Hosseinzadeh H, Sadeghnia HR, Ziaee T, Danaee A. Protective effect of aqueous saffron extract (Crocus sativus L.) and crocin, its active constituent, on renal ischemia-reperfusion-induced oxidative damage in rats. J Pharm Pharm Sci 2005;10:387-93. Boroushaki MT, Mollazadeh H, Rajabian A, Dolati K, Hoseini A, Paseban M, et al. Protective effect of pomegranate seed oil against mercuric chloride-induced nephrotoxicity in rat. Ren Fail 2014;10:1581-6. Bouroshaki MT, Sadeghnia HR, Banihasan M, Yavari S. Protective effect of pomegranate seed oil on hexachlorobutadiene-induced nephrotoxicity in rat kidneys. Ren Fail 2010;10:612-7. Mollazadeh H, Hosseinzadeh H. Cinnamon effects on metabolic syndrome: a review based on its mechanisms. Iran J Basic Med Sci 2016;10:1258-70. Palipoch S, Punsawad C. Biochemical and histological study of rat liver and kidney injury induced by cisplatin. J Toxicol Pathol 2013;10:293-9. Nematbakhsh M, Pezeshki Z, Eshraghi-Jazi F, Ashrafi F, Nasri H, Talebi A, et al. Vitamin E, vitamin C, or losartan is not nephroprotectant against cisplatin-induced nephrotoxicity in presence of estrogen in ovariectomized rat model. Int J Nephrol 2012;10:284896. Baek SM, Kwon CH, Kim JH, Woo JS, Jung JS, Kim YK. Differential roles of hydrogen peroxide and hydroxyl radical in cisplatin-induced cell death in renal proximal tubular epithelial cells. J Lab Clin Med 2003;10:178-86. Silva CR, Antunes LM, Bianchi ML. Antioxidant action of bixin against cisplatin-induced chromosome aberrations and lipid peroxidation in rats. Pharmacol Res 2001;10:561-6. Öztürk M, Aydoğmuş-Öztürk F, Duru ME, Topçu G. Antioxidant activity of stem and root extracts of Rhubarb (Rheum ribes): an edible medicinal plant. Food Chem 2007;10:623-30. Liu H, Gu LB, Tu Y, Hu H, Huang YR, Sun W, et al. Emodin ameliorates cisplatin-induced apoptosis of rat renal tubular cells in vitro by activating autophagy. Acta Pharmacol Sin 2016;10:235-45. Waly MI, Ali BH, Al-Lawati I, Nemmar A. Protective effects of emodin against cisplatin-induced oxidative stress in cultured human kidney (HEK 293) cells. J Appl Toxicol 2013;10: 626-30.